Razer, a world leader in connected devices and software for gamers, announced the Razer Stargazer desktop webcam at CES 2016 last week. This webcam delivers the best video capture quality in a webcam and simplifies traditional streaming setups. The Razer Stargazer revolutionizes webcam use as the first device of its kind suitable for quality streaming content production. It sets a new benchmark for video capture at 60 frames per second at 720p, a magnitude better than the 30 frames-per-second limit of common webcams, and it can provide high-definition 1080p video at 30 frames per second. The Razer Stargazer also includes an automatic noise-cancelling, dual-array mic. The Stargazer is powered by the Intel RealSense technology that enables the next-generation features that push the boundaries on what a consumer-grade webcam is capable of right out of the box. What makes this webcam really special is the Dynamic Background Removal capability in which it eliminates the need for full-scale green screen setups traditionally used by streamers. The webcam’s Intel RealSense Technology enables the camera to intelligently sense depth to separate foreground from background. This feature works with popular broadcasting software like OBS, XSplit and Razer Cortex: Gamecaster. The Dynamic Background Removal capability also opens possibilities beyond gaming. Video conferences using Skype with Personify will be able to remove or swap backgrounds. FaceRig, QQ Video and ooVoo are also supported by the camera. Face and object 3D scanning will work out-of-the-box, and users can accurately port real-life objects into the digital world in full-HD. This holds promise for game development, as captured 3D scans can quickly be ported directly into development engines like Unity. 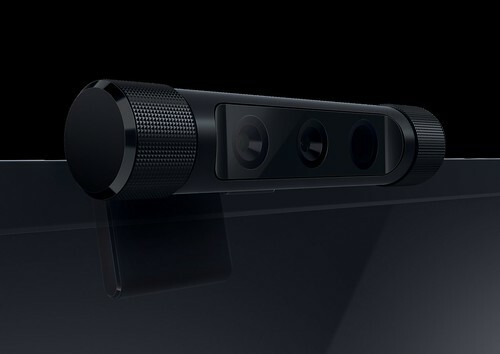 The Razer Stargazer also offers the most advanced facial and gesture recognition in a consumer camera. Up to 78 points on the face and 22 points on each hand can be tracked by the webcam. With this sensor advent, users can unlock their computers via Windows Hello’s face security system, launch applications with gestures, and play games that track facial expressions and hand movements like Nevermind and Laserlife for a new level of immersion. The Razer Stargazer joins Razer’s one-stop-shop for streaming hardware – including the Razer Seiren and Seiren Pro microphones and related accessories – and will be available in Q2 2016. Razer plans to send out a limited number of Razer Stargazer units free to streamers via its Sponsored Streamer Program.